Cool down the temperature and camp in comfort with the best air conditioning options for your tent. We have reviewed a variety of AC systems suitable for camping. Black & Decker offers a wide range of portable AC systems to cool any sized tent. 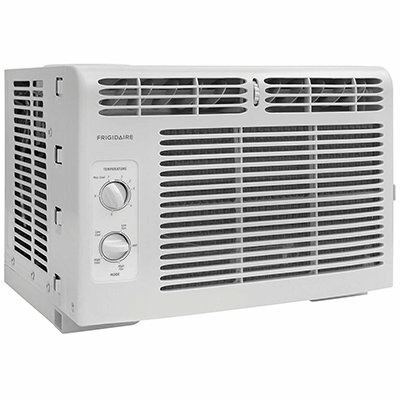 We love this frigidaire air conditioner because its small, easy to carry, quiet and cheap! This versatile 12V portable air conditioner provides comfort in small spaces whilst remaining easy to move. Camping is a great activity that takes us away from the stresses of everyday life like work and the constant beeps and blurbs of technology. For some, this might mean becoming completely unplugged, but there are a few technological creature comforts that can be used to make your camping trip more enjoyable for the whole family. Today we will be looking at portable AC units for camping. Yes, what a time to be alive when you can bring your AC unit along for the ride. Research shows that it’s easier to fall asleep and stay asleep when the area you’re sleeping in is at a lower temperature. So next time you’re invited on a summer getaway but feel hesitant because you don’t want to sleep in the hot, sticky air, just come equipped with a small portable AC unit. In this article, we review our favorites on the market to help you pick the right one for your camping needs. Key Camping Question: Do You Have Electricity? Yes – Most public campgrounds have electricity hook-ups, but it will be best to make sure ahead of time that you will have access to AC. With electricity you will be able to use any kind of portable air conditioner that you like, from small window units, to full tower units. No – If you’re heading off grid to where there isn’t an electricity hook-up, you can still have a portable AC unit. Several units on the market run on 12V batteries and many have options to be charged in your car. These AC units are usually less reliable and obviously won’t run as long, but they are still better than the alternative. These units are literally the same units that supply air to a bedroom or small apartment. They run on about 5000 BTUs and can keep an area of 150 square feet cool, which would make this the ideal choice for an average-sized tent. This option, however, does require a ventilation spot that fits the entire unit, so you may have to alter your tent to accommodate it. If you are a serious camper these provide cooling comfort for most tent sizes. We have reviewed the smallest window AC models on the market here. Generally more powerful than window air conditioners, portable AC units are known to cool spaces up to 400 square feet at 12000 BTUs. The models themselves can be quite bulky (weighing up to 100 lbs) but are often set on wheels to help you maneuver them around. Portable AC units still require ventilation, but usually only a smaller hose instead of space for the entire unit. Most of these portable air conditioners also work as dehumidifiers and have an internal tray that collects water. If the water bucket fills up, the AC unit will automatically turn off until it is emptied. We have featured 2 great options for camping and have also reviewed several more brands in this article. Spot coolers are the heavy-duty models of portable air conditioners, and they often even resemble their full, permanent in-home cousins. Running at 15000 BTUs these air conditioners are the most powerful of the portable options. Most people who buy spot coolers are probably looking to use them for a more permanent location like a garage or workshop, but if you’re willing to put in the heavy lifting and extra setup, then they can be perfectly suitable for camping as well. Battery-powered AC units are easier to setup and use but are less reliable and powerful than electric versions. Most 12V portable AC units are compact, so they are good for smaller spaces. 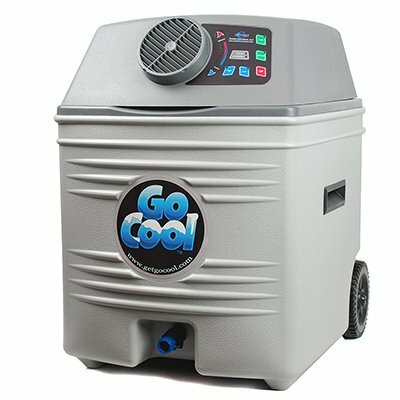 The main way that these battery-powered units work is that the user will fill the unit with ice (or water, in some cases) and a small fan will work to convert that energy into cool air. These units are recommended for smaller tents and personal use. Portability is an interesting factor in choosing a camping tent air conditioner, because what one person deems as portable will not always be the case for everyone. For example, some people will have no problem at all bringing an 80 lb AC unit on a camping trip where they can pull up to the campsite and easily get it out of the back of their pickup. For others, this task is going to seem nearly impossible. Before purchasing your portable air conditioner, ask yourself how much you’re willing to carry, how big of a unit are you able to transport, and how will you maneuver the unit throughout the trip. AC power levels is in close connection with our power source. BTUs are British Thermal Units, and are numbers given to appliances that indicate how much energy an appliance will use to either cool or heat a given space. It’s right to assume that the higher the BTUs, the more power it has, and in general the more space it can cool. But when it comes to portable AC units, the key thing to remember is that you would like a constant, cool temperature in your tent. If you have a small, two-person tent but you have a large portable air conditioner that runs at 15000 BTUs, it will get your tent to the desired temperature faster but then will shut off until the temperature dips below that number again causing itself to cycle repeatedly. This action will shorten the lifespan of your product because it is not working at a level that it was intended. Make sure to find the appropriate BTU outputting before you purchase your portable AC unit. Your tent size will greatly influence the type of portable air conditioning unit that you will need to buy. This article points out that tents are usually listed as either 4-person, 6-person, etc. but that they don’t often take into consideration extra space for gear such as portable air conditioners, or even extra baggage. For this reason, you will want to know the square footage of your tent and how much space you will require for an air conditioning unit. In general, each person that you’re traveling with will require about 30 square feet of space to be comfortable. You’ll also need to consider how many people will be sleeping in a shared space. It will be much easier to cool an area with one person than with eight because the ac unit would have to work harder to surpass all the body heat being put off. The first thing to consider when looking to purchase a portable air conditioner for tent camping is whether you will have electricity at your campsite. Many public campsites offer electricity hook-ups, but the voltage may vary by location. If you decide to take the electrically sourced route, you will also need to consider buying an outdoor extension cord to reach your appliance. If you decide to use a 12V battery for your AC unit, you will want to consider back-up batteries and/or how you will recharge the unit. As with any tent sleeping experience, you will need to consider the airflow and ventilation for your air conditioner. 12V battery-powered AC units won’t require any extra ventilation other than what is built into your tent. Electric AC units will require a ventilation to the outside. Window units require large vents, as the AC literally fits half in/half out of the tent. 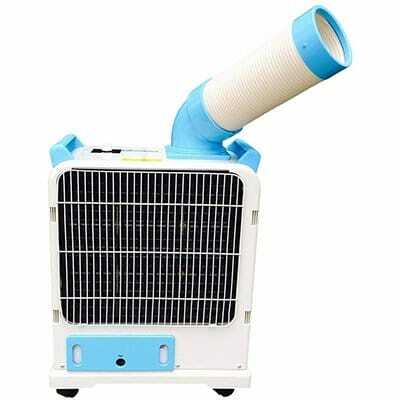 Portable air conditioners and spot coolers require a smaller vent for a tube to exit the tent. Fortunately, having AC units for camping is growing in popularity and many tents are now being manufactured with a large vent to accommodate an AC unit built right in. If your tent doesn’t have this feature, you may be able to work something out within one of your existing doors or windows. The level of noise any AC emits is a key concern for buyers. When camping, however, this is less of a priority because your natural surroundings will likely soak up most sounds that come from your air conditioner. Nevertheless, always look at a units decibel level or dBa. As a general rule, anything under 60 is good and won’t bother you or your neighbors. Once you get above 70 dBa it starts to become more of an issue. Here is another article discussing the quietest ACs for home and even camping use. Nearly all things come for a price and as the saying goes “you get what you pay for.” Having a portable AC unit with you on your camping trip, though growing in popularity, is still considered a luxury item with units ranging from moderately expensive to very expensive. As with every other consideration though, the higher the price does not necessarily mean the better product. You need to look at all the considerations to choose the right portable AC unit for your needs. And if all else fails, you can always do the tried and true DIY camping air conditioner of filling a 5-gallon bucket with ice and hoping for a breeze. Max Tent Area 150 sq.ft. Dimensions 16 x 15-1/4 x 12"
I love that this little window-mounted air conditioner is about as easy of an appliance as they come. The temperature and mode dials are simple, and you basically plug it in and you’re up and running. It is 41 pounds, but it’s compact sizing makes it easy to carry. I highly recommend this one for camping if your tent has a ground vent made to fit an air conditioner – it will be perfect! This “little guy” easily cools off an area of 150 ft indoors, but if you’re in a tent will need to work a little bit harder since air will obviously escape more easily. For that reason, I would recommend this for a 4-person to 6-person tent at most and areas of approx. 100 square feet. Larger BTU options are available for bigger tents. 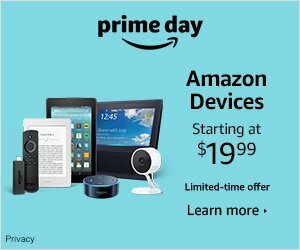 BestBuy praises this product too, with 92% of customers saying they would recommend it to their friends. One thing that should be noted is that this one must be completely ventilated to the outdoors. The back blows out warm air and failing to vent this would defeat the purpose of the product. If using in a tent you also need to make sure that it’s not sitting on the level ground. It needs to be up on at least bricks to vent properly. It does come with a pleated window kit although in my experience, some stable wooden blocks or bricks will do the job just fine. Also be aware and keep an eye on the draining condensation as this can build up at the base of your tent. Max Tent Area 150 sq. ft.
Dimensions 16 x 12 x 15.4"
If your tent already has a vent for a window air conditioner, or you plan on creating one yourself, then this unit from hOmeLabs will be perfect for your next camping trip. It’s lightweight at 37 lbs and travels easy, unlike some of the bulkier AC models out there. But best of all, it does its job in a compact and reliable manner. The team over at Householdme tent to agree with us – stating: ‘It is an affordable and effective‘ cooling options for smaller areas. It does have a slightly noisier output than the Frigidaire AC above, coming in around the 60 dBa level. This should not be enough for your neighbors to complain about your loud AC keeping them awake. They may however be jealous that they didn’t bring one along too! The built-in leaf guards and the washable filter make this camping AC unit ideal for camping tents that are up to 150 square feet. Once again though, because the walls of a tent are different to a home, I recommend this model for 100 square feet spaces. That should still easily see this air conditioner keeping at least 4 adults comfortable all night. The only con about this product is that it is not suitable for use with extension cords (indoor or outdoor). The cord that it comes with is 6 feet long, which is alright, but you’ll want to make sure to set up your tent close enough to your electric hook-up to make this one work. For this reason, I prefer the #1 choice if you need a window AC unit for camping. Max Tent Area 350 sq. 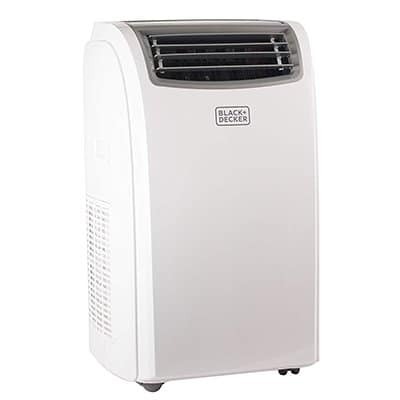 ft.
Dimensions 17.1" x 13.8" x 28.1"
Black & Decker has been a trusted brand for many years, and their portable AC units are high quality and long-lasting. I first used a unit just like this one when I was living in an apartment in NYC. It was perfect because the vent hose was five feet long, which allowed me to point the AC unit towards the living room during the day, and into the bedroom at night. This 14000 BTU unit is great at cooling a 350 square foot indoor space. It would easily keep a large family tent cool if you keep the indoor “walls” open to each other. This portable AC unit is 83 lbs and must be stored upright, so you’ll have to consider this when packing for your camping trip and making sure you give it enough space in the tent too. But perhaps the best feature of all is that this unit doubles as not only an AC unit but a heater, which makes it ideal for going camping in places that are hot during the day and super cold at night. This is a superb choice for a commercial tent as well and once set up correctly can cool (or heat) large enclosures. It is not as quiet as the window AC’s although because it is best suited to larger spaces because it does not need to be drained and noise is then less of a concern. Dimensions 17.3 x 12.8 x 27.4 "
For smaller tents (that fit 2 to 4 people), the Emerson Quiet Kool is a fantastic option for those searching for a portable air conditioner. There are a lot of features packed into this AC unit that make it ideal for a camping situation. First, although it does weigh 53 pounds, it has both side handles and wheels for easy maneuverability. It will need a little space of its own inside your tent, but its nice ventilation system is can easily be put in a window or door vent of your tent. 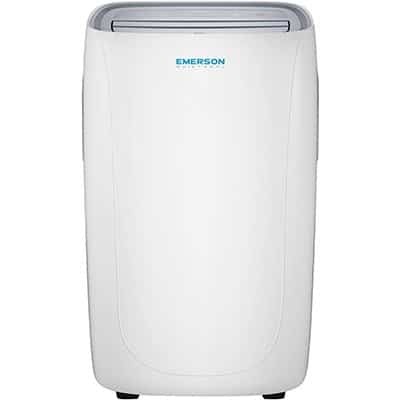 And it might need to work a little harder in extremely humid climates, but the Emerson Quiet Kool is also a dehumidifier. Unlike some AC/dehumidifier combos, this model has a built-in evaporation technology, which means you don’t have to empty a drip pan every 4 to 6 hours on a humid day. Win-win! Most of the other reviews I read commented on just how quiet this portable AC unit is, and it’s true! I would compare the noise that it makes to that of a refrigerator or 52 dBa which is the lowest of any system we have reviewed. The remote control and timer options allow you to set and forget this system when out boating, hiking or fishing on your camping adventure. Max Tent Area 75 sq. ft.
Dimensions 27.4 x 20.2 x 11.7 "
Unlike the units from the Portable AC section above, a spot cooler like this Nakatomi X Uninex will sit on the outside of your tent and will vent cool air into the tent. That means more tent space for everyone and industrial strength cooling. This model is a top choice for smaller areas and comes with heating options for cold nights. 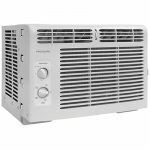 This AC unit does have a dehumidifier that works like a charm, but unlike some of the other models the condensation will need to be drained every few hours in extra humid climates. These units are quite bulky but are generally not too loud with a dBA of around 60. Due to their large size and the fact that they sit outside your tent, don’t be surprised if your camping neighbors want to come over and check this one out! Great not only for camping, but many people find that spot coolers are essential to outdoor gatherings like weddings and celebrations. There are many commercial grade options available for large tents, such as our recommendation of the Movincool Classic Plus 26 Commercial Portable Air Conditioner. Best For Up to 50 sq. ft. If you’re a regular camper, it’s really worth investing in quality products. From your tent to your sleeping bags, enjoying camping can really boil down to having the right equipment. 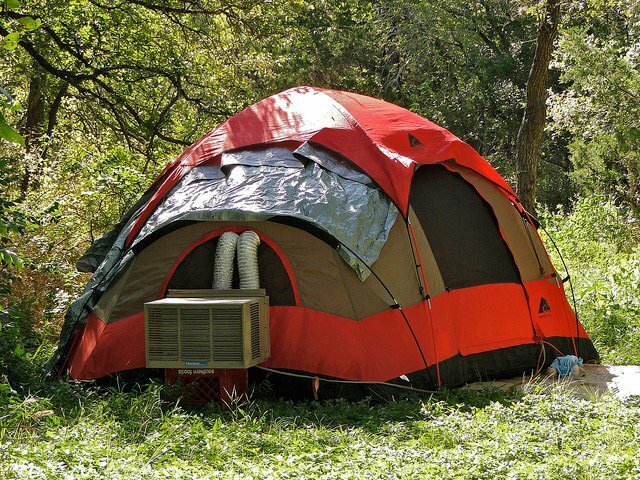 Your AC unit is no exception – tents can get hot and sticky, especially if you’re camping in the warmer months. The Zero Breeze is perfect for campers, as it’s highly portable and compact, fitting into your tent easily and not taking up too much room in your packing! The Zero Breeze works to cool down areas of up to 50 sq ft, so you’ll be able to maintain your ideal temperature inside your tent, even in the heights of summer. This AC unit runs about 1100 BTUs, so it’s pretty powerful! Because it only requires 12V, you don’t need to worry about finding a mains power socket until it comes to charging it. One of the best aspects of this little machine is that it can be converted into a heater really easily. If you’re camping in springtime, you might want the tent to be cooler in the daytime and warmer while you’re going to sleep in the cooler evenings. If you’re braving the wilderness in the winter months, you’ll be able to use your summer AC unit to keep you warm – it’s a great multitasker that saves you money. Performance-wise, most users have been impressed with what the Zero Breeze can do. It’s designed to be leak-/drip-proof, with a large evaporator. This reduces the annoying sogginess that some AC units can generate inside your tent and also means there’s less maintenance involved and less chance of it going rusty! In our experience, this unit is good but you will have to calm your expectations of what it can do. It is not cheap, will only cool small areas, and can feel loud inside a small tent. It also requires users to follow set up and instructions closely when using it. We feel it is best suited to regular campers who want a little extra comfort. Max Tent Area < 30 sq. 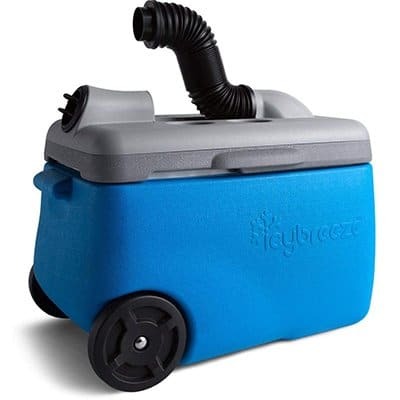 ft.
Dimensions 17 x 19 x 25 "
It’s not quite as reliable as most of the electric portable or window air conditioning units, but if your next camping adventure is off-grid or you’d just like to be as green as possible, then the IcyBreeze Cooler Blizzard Package may be the right choice for you. So long as you have access to ice and water that is! It runs on a 12V battery, and when filled with ice and water will run for about 7 hours. This package comes in several different colors and with both a wall charging unit and a car charger adapter, which means that if you did have an electricity hook-up that you could still run it even if the battery is dead. The major flaw in this product is that the battery is not removable. This means you cannot swap it with a back-up battery and keep using the same ac unit, and when you’re charging it you must move the whole unit instead of just putting the battery in your car, for example. It also produces minimal cooling power and doesn’t compare with a real AC unit. I have used one of these on a recent camping trip and found it was suitable for someone who needs a reprieve from the heat and doesn’t have any electricity options. 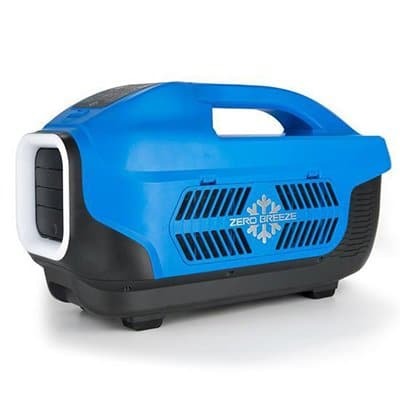 Dimensions 17.3 x 20 x 24"
The GoCool 12V Portable Air Conditioner is made for small spaces. As far as camping goes, this cooler would be ideal for a person camping alone or for two people sharing a very small tent. The cooler itself is lightweight and easy to maneuver at just 33 pounds, and it can amazingly hold up to 40 pounds of ice. What I love about this product is that because it runs on a battery, it is extremely quiet and there is never any exhaust that you have to worry about breathing in or sending off into the woods. This is a very eco-friendly product. The downside to this product is that the battery only lasts about 6 hours, and unlike some of the other products we’ve looked at, the battery charger for this one is sold separately. It is suited to those who want a small slice of relief from the heat without dealing with a complicated set up. Camping with a portable AC unit has its pros and cons. We’ve made a list of the big influencers that might sway you one way or the other, to help you best decide your own cooling needs. Considered A Fan For Cooling? If you’re not quite ready to purchase a portable AC unit for your next camping trip it doesn’t necessarily mean that you need to go without any cooling relief. There are many portable fans on the market that can help you stay cool and are even more portable than their cousin AC units. My favorite fan for camping is this HAITRAL 2IN1 Portable LED Camping Lantern with Ceiling Fan. It sounds like a mouthful, but this little fan is super small and super powerful. It has a special clip that allows you to hang it up in your tent or even on your hiking backpack. It takes just two D batteries and can last up to 50 hours, which I find quite impressive. I also recommend this O2COOL 10-inch Portable Camping Fan with Light as a travel option because it will completely fold up and fit in your backpack. The only downside to this one is that it requires 6 D batteries instead of 2. A 12” milk crate to rest the AC unit on – The AC unit must not sit on the ground or it will not work correctly. Bricks are also a suitable choice. Items to seal any gaps: extra tent material, small towels, etc. This helpful YouTube video shows how to set up a small window AC in a tent that has a built-in vent for the purpose. How will humidity levels affect my air conditioner? Humidity will cause the air conditioner to work a little harder to cool you off and potentially have more ‘run off’. Many models have a built-in dehumidifier that can be extremely helpful. Be aware of which area your AC unit is draining towards. How can I insulate a tent to help the AC? For safety reasons, it is not recommended that you alter the tent in any way that would insulate it beyond its original specifications. It would be best to purchase a tent more suitable to your needs or to find an AC unit that will work more efficiently with the space you have. In saying that, place your tent in a shaded area is a smart idea. Consumer reports suggest blocking the sun so use a darker colored and waterproof ‘fly’ will help cool the space inside. I have a larger tent. Which is a good choice? Portable AC units and spot coolers both work well for larger tents. We highly recommend this Black & Decker model that can double as a heater. This is because of the higher BTU’s (14000) it provides. This option should sit close to the front door out window cutting so it can drain any excess fluid. I have a small 1-2 person tent. Which AC should I use? 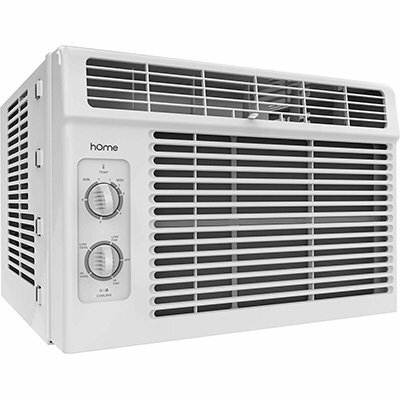 If your tent has a proper vent, installing a small window unit AC like the hOmeLabs Window Air Conditioner would be ideal for a small tent and will keep you plenty cool. This is because it is slightly smaller than the Frigidaire option. If you are squeezed for space, you might consider looking at one of the 12V options instead. Is it safe to use AC inside a tent? Many portable AC units are safe to use inside a tent, if you are following the instructions and using proper ventilation. Which tents come with a hole for my Air conditioner? As portable AC units become more popular, many tent manufacturers are adding vents specifically designed to fit AC units. We recommend this family sized tent by Ozark Trail. Camping has come a long way from the bare bones outdoor adventure that it used to be, and now we can even bring along our AC units for a little home comfort and better rest. We hope this guide has served you well in your search for a portable air conditioning unit for your next camping trip. We highly recommend both small units like the Frigidaire FFRA0511R1 and larger units like the Nakitomi Spot Cooler. Whether you’re traveling alone or with a group of twelve people, there is a portable AC unit that will be just right for your next trip.